If you've got an old Jeep, or you plan on lifting your current Jeep, odds are you're going to need new shock absorbers. Some lift kits comes with shocks included, but many do not. Also, some lift kits come bundled with cheap shocks that you'll end up upgrading pretty quickly anyways...so, make sure you read the fine print and understand what you're getting. 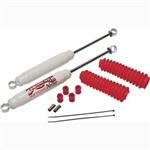 The right shocks can make a big difference in your ride quality & handling.